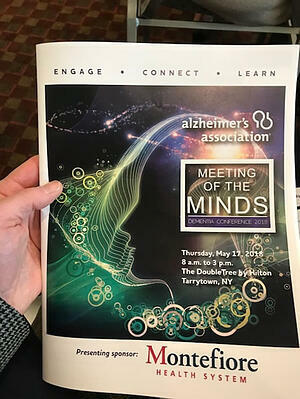 Great networking and takeaways from Meeting of the Minds Fourth Annual Hudson Valley Regional Dementia Conference. Big challenge caring for someone with Dementia, “keeping connected.” "This is not the end of road but a bend in the road, there is still lots of life left to live. It just may take a bigger village to live life -friends and family support is necessary." It's important to remember as caregivers we must be a friend, a coach and listener. It is imperative to build our patients up, help them help others and offer encouragement. Remember to slow it down, engage in eye contact and reduce the complexity of questions. Reminisce with your patients, play music and exercise with them, help to keep them active and engaged, it makes a world of difference!